– 4 pushbutton and header sockets. what’s up with ‘Kickstarter,trademarks and lies’ ??? why did you close it down ? you don’t like anymore,to listen to your comunity opinion ? should we post here instead ? How is the screen controlled? I understand the game controls are wired up to the Arduino Leonardo, but what about the screen? Would love to know more. I used an old netbook witch I separated the screen from the computer. I plan to add more pictures on my Google+ account, but right now you can see one picture showing the inside. How are you interfacing the display? That is a really really sweet build. You must be proud of that, I certanly would. How did you find getting that board done by Fritzing? Am thinking about using them myself. How much did that board cost you (if you dont mind me asking) did you have a single board printed or multiple? 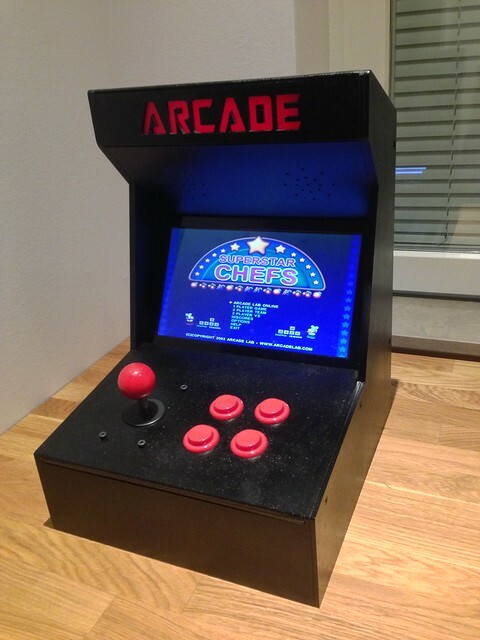 Thanks and nice job with it, I would love to have my own arcade machine. Oh and please stop HiJacking threads people, this is not the place to discuss that issue. The comments we turned off on that blog post as they were getting increasingly angry and it was turning into a flaming post. If you want to talk about it then I would go and use that Yellow Boards own site. Timothy, very cool. Can you show us your drawings? Thanks! The screen is separated from the computer but is still connected. Thank you! I found Fritzing while I was reading a tutorial on Arduino’s website. The board costed 34€ + vat and shipping. I just bought one and I can recommend Fritzing. Good luck with your project. Thanks! You can find the drawing at my Google+ page. The funniest thing, is that I created my trainer for the same purpose, to create an arcade interface (but in my case for PS3). Usually I do not read article on blogs, however I would like to say that this write-up very forced me to take a look at and do so! Your writing taste has been amazed me. Thanks, quite great post.